True armyworm is a migratory pest that arrives in Iowa from southern states and lays eggs on living tissue. Adult females are attracted to fields with green plants, particularly weedy grasses or living cover crops. These plants serve as initial feeding sites for larvae. When these original host plants are no longer available (defoliated or terminated by herbicide), larvae move to adjacent corn plants. On corn, larval feeding begins on the lower leaves and continues up the plant as leaf tissue is removed (Photo 1). Larvae can be found in the whorl of young, injured plants. Fields with crop residue or a living cover crop should be scouted for true armyworm once corn has emerged. Significant stand losses can occur with true armyworm infestations. Photo 1: Typical true armyworm feeding injury on corn. Feeding begins at the leaf margins, and larvae will consume everything except the tough midrib. Photo copyright Adam Varenhorst. True armyworm larvae can be identified by dull orange stripes along each side of their body (Photo 2). They also have four fleshy prolegs with dark bands on their abdomen in addition to six legs on the thorax. Larvae have an orange head capsule with black lines. Adults are identified by a white spot in the middle of the wing and a solid dark line at the edge of the wing that becomes spotted toward the middle (Photo 2). Photo 2: True armyworm larvae (left) can be identified by dull orange stripes along each side of the body, banded prolegs, and orange head capsule. Photo copyright Adam Varenhorst. True armyworm adults (right) can be identified by the white spots in the center of each wing and dark line from the edge of the wing. Photo courtesy of University of Missouri IPM. 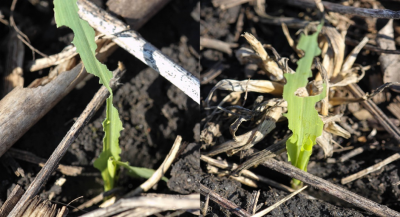 For corn seedlings (VE-V2), recommendations for foliar insecticide applications occur when 10% or more of the plants are injured and larvae are less than ¾ inch long. 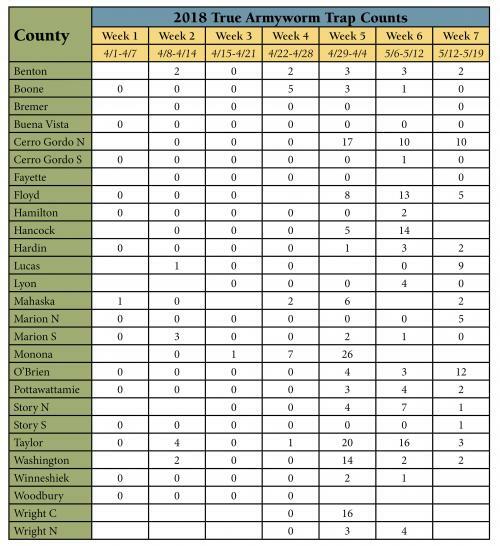 When corn is V7-V8, treatment should be considered only if larvae are ¾ inch long with greater than 8 larvae per plant and 25% of leaf area has been removed. Larvae this size are expected to feed for another week and may cause more injury.